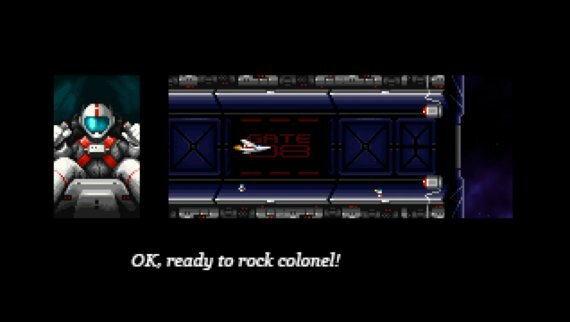 This is an exceptional statement for all the shoot’em up pilots. Yesterday, it was planned the deployment of all Delta Lance spaceships to face the invasion of the Meroptian fleet in PS4 and PS Vita. However, despite the estimations of the Galactic Alliance composed by Abylight Studios, Locomalito and Gryzor87, serious turbulences were found during takeoff maneuvers. Due to external and totally unexpected circumstances out of our control, some PS Vita squads suffered delays and the cross-buy technology, which was supposed to defeat Hydorah in all Sony platforms, failed. Finally, after making some tweaks, Super Hydorah is now available on both platforms (PS4 & PS Vita). We’re still working on a solution with Sony to make the cross-buy option available as soon as possible. For the moment, it’s working on US regions and we expect to be fixed in EU territories soon. However, it will take a bit longer than desired, at any rate it will be working eventually and for those who have already purchased one of the digital copies, the other will be made available with no extra cost. *Update: Finally, the cross-buy option is available in both regions! It will most likely mean that Vita users will need to go to the game in the Vita store to download the title. It is unlikely that it will automatically appear in their download list. We’ll keep you on current about any progress on this. Also, you can subscribe to our newsletter to be updated on new information personally. Tags: cross-buy, Gryzor87, Hydorah, Locomalito, PS Vita, PS4, SHMUP, shoot'em up. Super Hydorah lands today on PS4 and PS VITA! RC Club: The ultimate radio control simulator – Now available on iOS!